The Tacoma Dome Station at 610 Puyallup Avenue, Tacoma is a major hub with the buses, Link and Sounder all right there. The station includes two seven story buildings and contains 2,500 parking spaces. It cost $10,500,000 to build in 1999. 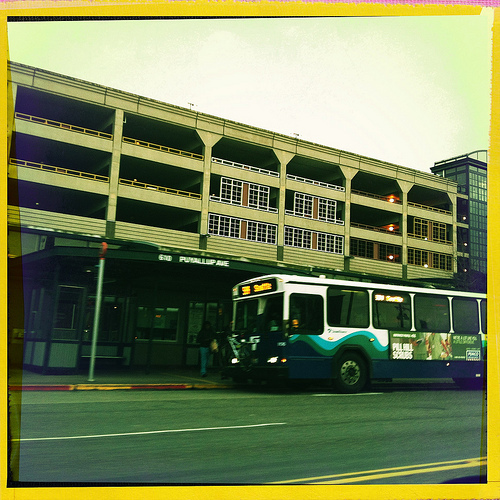 This entry was posted in Government, Tacoma, Travel, WA State - Pierce County and tagged bus, concrete, dome, Link, park and ride, parking, Sounder, station, Tacoma, Tacoma Dome Station, train on March 22, 2012 by admin.